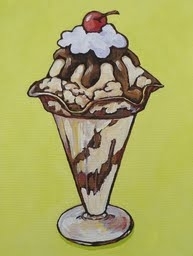 It’s National Hot Fudge Sun-Dae !!! In just a few short hours, I have managed to burn off tons (well, not really tons. but it feels like it 🙂 of calories at Zumba this morning. We had a substitute instructor this morning that was A-Maaazing! Lots of ‘glistening’ going on during and after the class. What’s in your plans this splendid ‘Sundae’?